When Irish Eyes Are Smiling has a light green "crelly" base with various sizes and shades of green and gold holographic glitter. I used 3 coats with a top coat of Sehce Vite. For whatever reason, this is the only St. Patrick's Day themed polish I own. 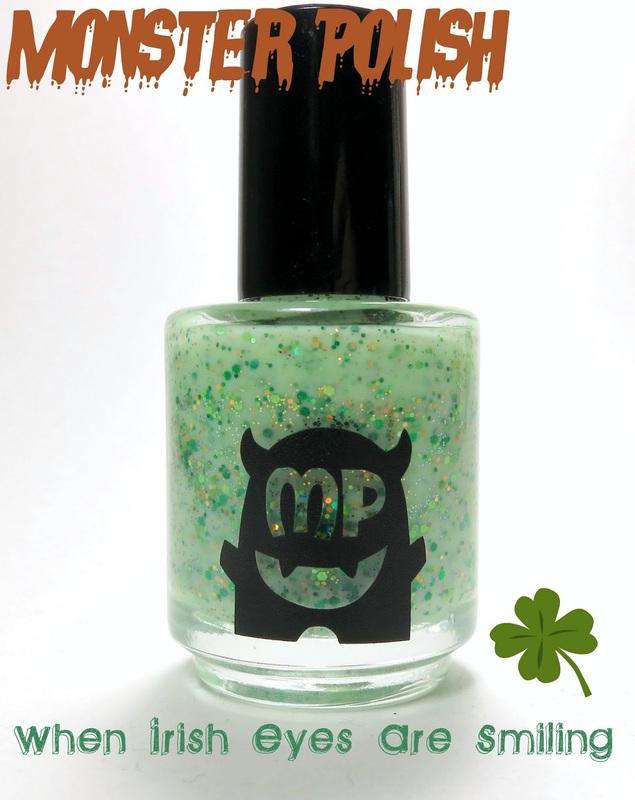 It is my favorite St. Patrick's Day themed polish though and not just because it's the only one I have! :P I love the holographic green glitters and how they look like a pot of gold at the end of a rainbow. Move over leprechauns, monsters can be at the end of a rainbow! Monster Polish is the creation of Polish Monster, aka Diana. You can obtain a Monster Polish by swapping with Diana or she sometimes will sell her pretties. To get in contact with Diana find her on her blog or on Facebook.